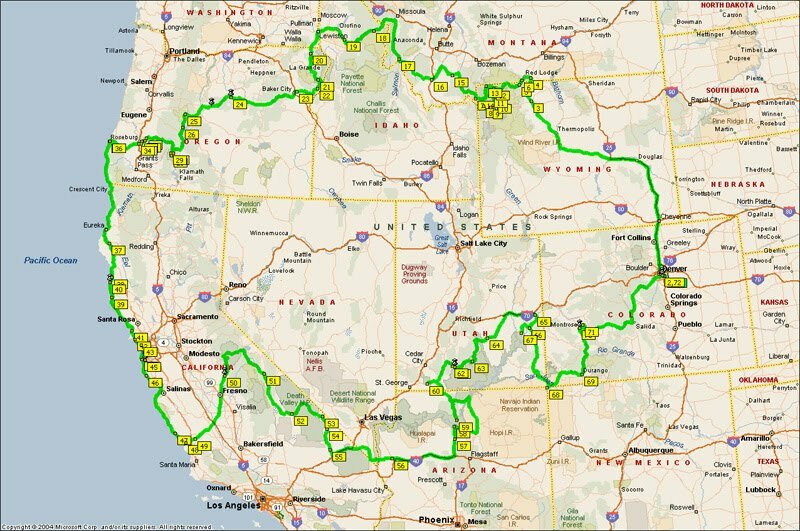 This is a report, and photographs, of my two week bike trip around some iconic sites in the West of the USA. This is a trip I had been planning with a good friend of mine, Uncle Phil (not really my Uncle but a nickname he had picked up from past motorcycle tours he had done as he was always willing to help anybody who needed it), from the www.my-mc.com forum. We had been planning this trip for over a year since our last trip together around the Alps in Europe in 2008, at which time I had unfortunatelly failed in my duties to guide him fully around the Alps as I had a vehicle break down while in Misurina, Italy. I am sure it was partly due to this that he then offered to guide me around the Western USA to at least gain revenge on me for sending him from Italy to Switzerland, via the Stelvio, with only some old papyrus maps to guide him. We had joked that once he had got me to America he would fake a wheel bearing failure on his bike and leave me to complete the trip on my own with only paper maps written in Navajo Indian language, the nearest he could find to match the foreign languages he had to deal with. Half way through our trip these jokes would come back to haunt us. As our plans developed we decided this was not going to be a leisurely holiday but an intense visit to as many iconic sites and biking roads that we could fit in in two weeks. Our trip was to be a loop of 6000 miles starting and ending in Denver and running down the Pacific Coast Highway. Although I will try to make this as interesting as possible Uncle Phil is a more experienced writer of motorcycle trips and his report will also be on his web site, my intentions here are to basically show my photographs and give statistics and a few details of the trip.